Cars queuing for Krispy Kreme in Blanchardstown. RESIDENTS IN BLANCHARDSTOWN have witnessed chaotic traffic scenes at the recently opened Krispy Kreme Doughnuts outlet at Blanchardstown Shopping Centre. 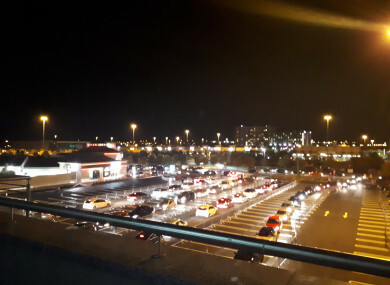 People living in apartments nearby report that it has been a “nightmare” to sleep because of the constant queues of cars and drivers who frequently blow their horns. The store, which is the first outlet to open in Ireland, closes at 11pm but the company also operates a 24-hour drive-through. Krispy Kreme opened the outlet on Wednesday of last week, with hundreds queuing before 7am on the opening day to place an order. Speaking to TheJournal.ie, local resident Kim Grehan said that the Krispy Kreme outlet was located “just to the right” of her apartment balcony. Around 11pm people go mad. I don’t know why they’re beeping because you can tell even before you get into that line of traffic you’re going to be waiting a while. Grehan said that on Sunday evening she heard a row between drivers queuing for the popular American chain. She said she thought that drivers who came to the shopping centre were under the impression they would get their doughnuts quicker, later at night. It’s so so bad. Things are actually getting worse. Grehan, who said that her area was otherwise quiet, said she was worried that with the festive season around the corner “it’s going to get absolutely mental”. She said that on Sunday night her two young children were crying because of the traffic and that tighter security is now needed at Krispy Kreme. The lack of sleep is getting to them. They were like zombies getting up. It’s the drive-through that’s the problem. We do apologise to local residents who are affected by this. To help encourage drivers to be respectful of residents we are getting signage made asking them to be quiet in the area and looking into other options to improve the situation. The company has said it is also engaging with shopping centre management to control traffic congestion. Salim Sanehi lives in the same apartment complex as Grehan. On Sunday morning, Sanehi filmed cars beeping while queuing for Krispy Kreme Doughnuts. The video, filmed at 2.35 am on Sunday morning, shows queues of cars continually sounding their horns. Sanehi said that drivers had recently started shouting at each other while queuing and that he rang the gardaí twice to complain of noise, once on Friday night and once on Saturday night. “Both times nothing happened,” Sanehi said. You can hear people egging other people on to beep their cars. Last night there was still beeping going on at 1am. Sanehi said residents of the apartment complex had now set up a Facebook group in response to the traffic and noise pollution. Local Fine Gael councillor Ted Leddy said that he has received numerous complaints from local residents. “I wasn’t quite prepared for what a big deal it was,” he said. Leddy said that he has been touch with Fingal County Council’s traffic department and had urged it to liaise with the management company which runs Blanchardstown Shopping Centre “to do something about the chaos”. Gardaí are also investigating a complaint that a car was damaged outside Blanchardstown Shopping Centre after 11pm on Monday night. It’s understood that the damage was done to a car that was outside Krispy Kreme. No injuries were reported and no arrests were made, a Garda statement said. Email “'A nightmare': Blanchardstown residents being kept up all night by beeping Krispy Kreme customers ”. Feedback on “'A nightmare': Blanchardstown residents being kept up all night by beeping Krispy Kreme customers ”.